Mango Appliqué biker jacket in gorgeous bright green. Loving this color, and what an affordable price too! Shein Faux Leather Buckle Belt Epaulet Detail Moto Jacket Absolutely love this color! It reminds me of juicy oranges and sunshine. The price is amazing too! Iro Ashville Leather Jacket. I absolutely love the gorgeous ocean blue color of this Iro Leather jacket!! It reminds me of the Caribbean Sea, wish I was there now! Iro Ashville Leather Jacket. The emerald green color of this leather jacket is just to die for. It’s such a bright gorgeous, kelly green! Perfect for Spring/Summer. Acne Studios leather jacket in chalk lilac (Exclusive to MyTheresa) I absolutely LOVE this pastel lilac color! The soft purple hue screams “Spring”, and reminds me of flowers blooming. Mango Appliqué biker jacket in lime. Wow, this color is amazing, and the price is incredible! I want this jacket in every shade! Iro Han Leather Jacket in Purple. I love this grape shade! It’s bold but can work easily for day and night! Perfect pop of color. Lamarque Donna Lambskin Leather Moto Jacket. Love the light sky blue color, and it’s buttery soft! Acne Studios leather jacket in red. Everyone needs a classic red leather jacket in their wardrobe, and this one is the perfect crimson shade! Amazing pop of color and incredible quality. 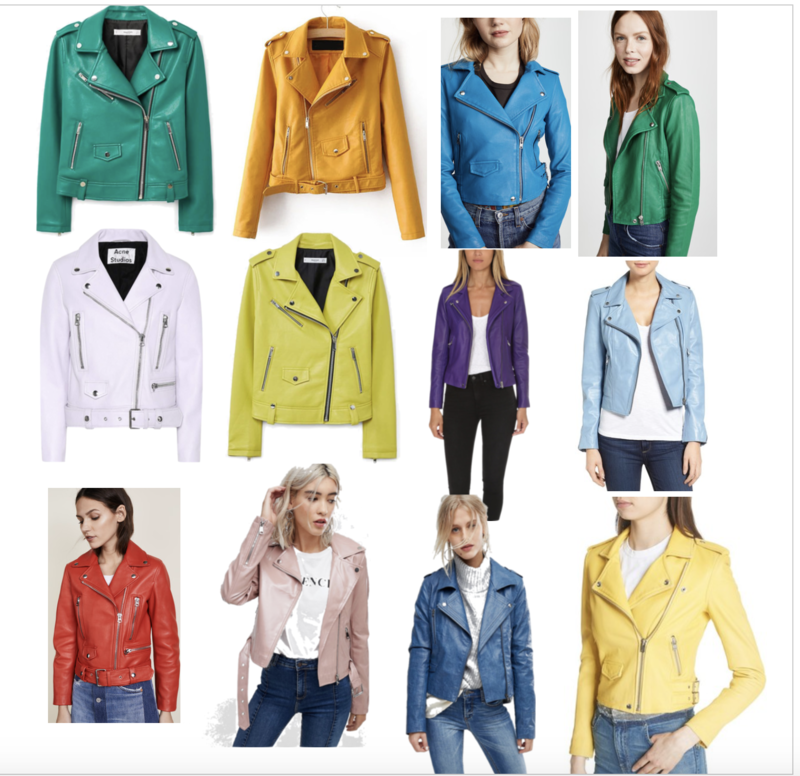 Asos Urban Bliss Patent Biker Jacket. I love this light shade of pink. Pastels are hot this Spring, and this jacket reminds me of the beautiful pink cherry blossoms that will be blooming soon. Asos current air leather look biker jacket. This blue jean color is amazing! Great neutral shade, and it can be dressed up or down! The price is great too, I can see this becoming a wardrobe staple this Spring. Iro Ashville leather moto jacket. This jacket is the color of pure sunshine, and makes me happy just looking at it!